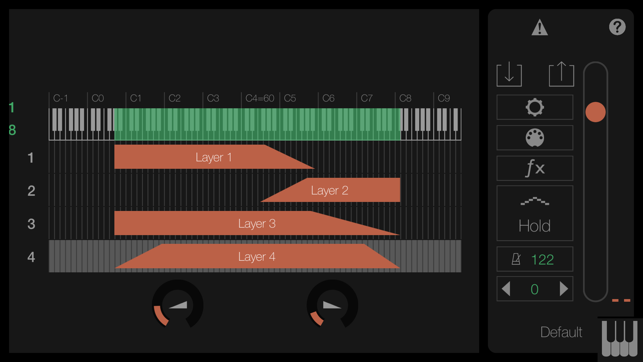 LayR is a massively polyphonic, multi-timbral synthesizer for iOS devices, optimized for modern 64 bit CPUs and capable of delivering up to 256 voices of rich, multi-layered and textured sounds. LayR's primary sound components are called Performances where a Performance is a set of Instruments and each Instrument is a set of Layers and each Layer is a complete synthesizer. A performance can consist of any number of instruments each with its own MIDI channel and crossfading keyboard span. Each Instrument can consist of any number of Layers to a maximum of 128. Each Layer has a dual oscillator that can morph with modulation between two shapes and phase states, two rich and warm state variable filters, a wave folder and a mixing section to blend oscillators and filters in any serial/parallel combination. For modulation (frequency, amplitude and phase) there are two Low Frequency Oscillators ranging from DC to audio frequency switchable to optionally follow keyboard pitch and restart phase when a note is started. Two loopable ADSR envelopes ranging from fractions of a second to over 100 seconds, an amplitude ADSR and a random number generator with a smoothing filter. With stereo delay, reverb and EQ on the output section LayR excels at not only emulating normal analog synth sounds but also at creating massive pads and huge spacy ambient textures with extremely long evolution cycles. Focused at keyboard players looking for a mobile synth that can be reliably used live on stage LayR is equally at home in the studio. An extensive selection of usable instrument and performance presets are included which can be loaded using MIDI bank select and program change messages in the same manner as hardware synths. LayR sports almost unparalled and extremely flexible MIDI control. Every parameter in the synth engine can be assigned to any MIDI Control Change number and parameters spread across multiple Layers can be grouped and controlled by a single MIDI cc with assignable range and direction. There is also an 8 track, 16 step Arpeggio Sequencer which can be used to create all sorts of exciting polyrhythmic looped patterns or even ambient generative music. Each track can have it's own speed, playback mode and length. 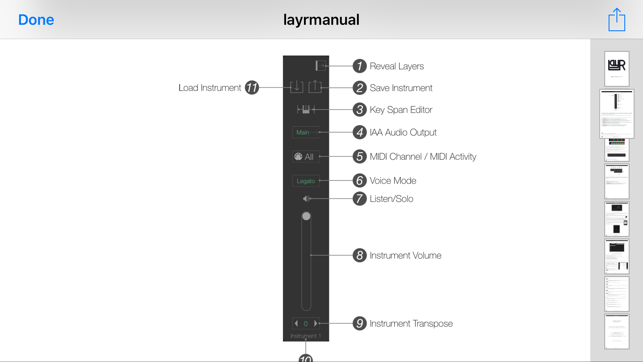 On top of all that LayR has a MIDI Controller Mixer that can be used during performance to control the synth engine in real time and can also transmit MIDI cc's from LayR's output port to other destinations. 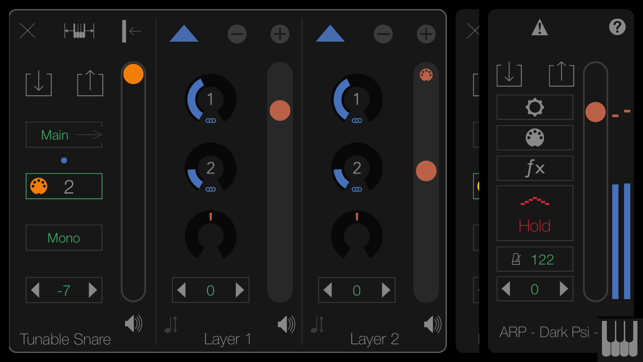 Full IAA, Audiobus, Audio Unit and Link compatibility means LayR can be used with all hosts and other music apps on iOS and desktop DAWs. 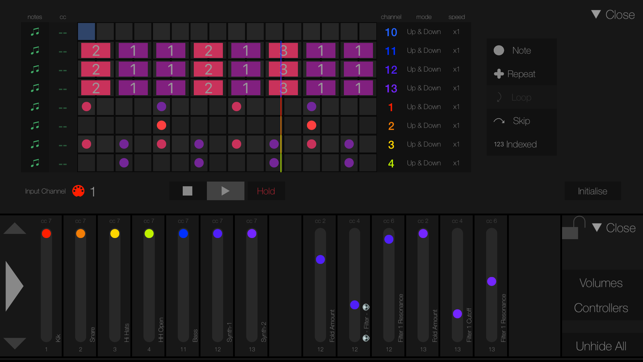 - A new "Hold" mode for the Arpeggiator, the old hold mode is now called "Latch". As long as at least one note is held down on the keyboard or via MIDI any other notes played will be added to the held chord. When all notes are released the chord continues to play until another chord or note is played. This makes it possible to play a chord on the keyboard and then change the key or sequence by playing another chord. All existing presets will load and play as before in Latch mode. - Added a new parameter editing panel in the editor: The "Dial Strip", see Link & Assign section in manual. 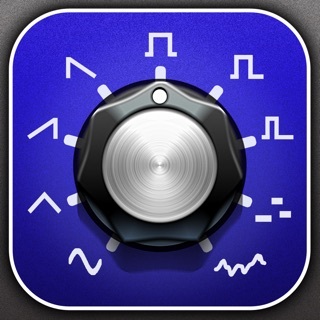 Dial Strip pops up a line of dials, one for the same parameter in every layer. 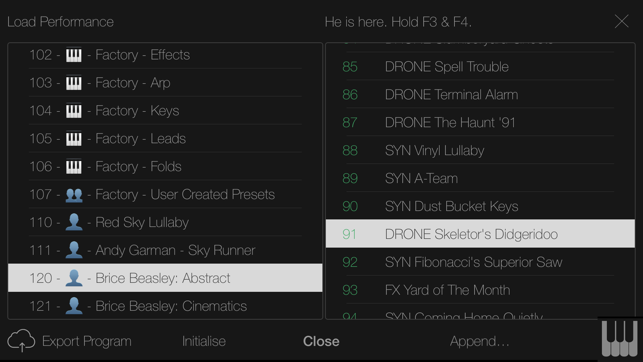 Use the strip to edit parameters in other layers and set links between parameters. - Added view insets for devices without home buttons. - Added an “Invert” button for Unipolar FM in the oscillator. This inverts the polarity of unipolar modulation. - Added a button to the Editor menu bar to choose between Link Assign/Dial Strip or none. - Fixed audio unit crash when host requests large buffer sizes. - Fixed: Fixed character filtering that replaces some unusable characters from preset names before saving. - Fixed: Voices with long attacks and long releases are no longer (incorrectly) restarted from the wrong level. - Settings View: Performance MIDI channel selector is now greyed out if option is disabled. - Some minor DSP engine optimisations. This synth has rich sounds that will blow you away! Being able to build with layers opens up a huge number of opportunities that will allow you to create some incredibly intricate sounds. Totally awesome in its depth and ability to create very complex, rich sounds in an interface that is remarkably intuitive for the power that it has. 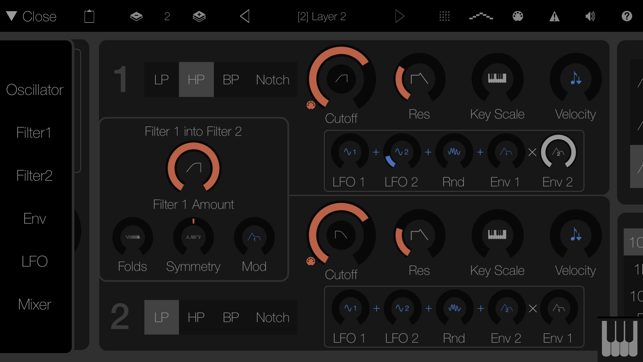 Plenty of great presets to get you started, too. Highly recommended!